Nieminen, Anu; Lehtonen, Mikko: Organisational control in programme teams – An empirical study in change programme context; in: International Journal of Project Management, Vol. 26 (2008), No. 1, pp. 63-72. Nieminen & Lehtonen search for control mechanisms and modes in organisational change programmes. Therefore the authors investigated four cases of organisational change programmes with a significant share of IT in them. Overall they identified 23 control mechanisms, which are used complimentary rather than exclusively. 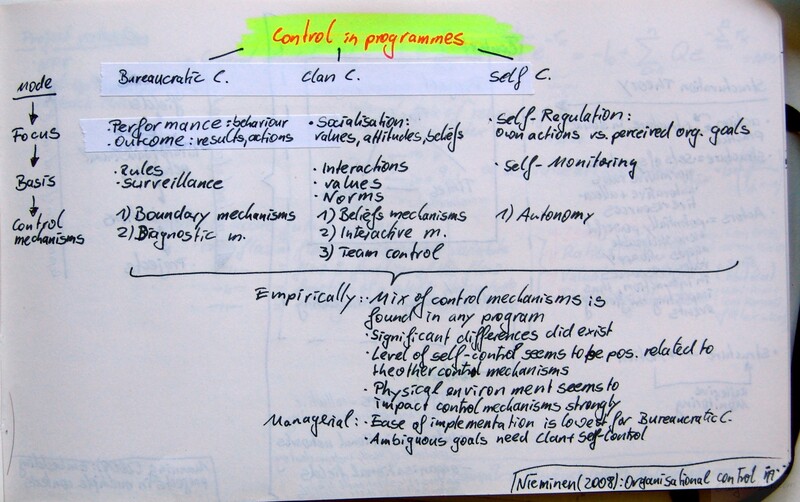 The identified control mechanisms fall into three basic categories – (1) Bureaucratic Control, (2) Clan Control, and (3) Self Control. For each of these Nieminen & Lehtonen describe the focus, basis, and mechanisms of control. Bureaucratic Control focuses on performance, i.e., behaviour, and outcomes, i.e., results and actions. The basis of bureaucratic control are rules and surveillance. Mechanisms typically employed are boundary and diagnostic mechanisms. Clan Control focusses on socialisation, i.e., values, attitudes, and beliefs. The basis of clan control are interactions, values, and norms. Mechanisms typically employed are belief mechanisms, interactive mechanisms, and team control. Self Control focusses on self-regulation, i.e., own actions vs. perceived organisational goals. It is based on self-monitoring and typically useses autonomoy as control mechanism. In their empirical study Nieminen & Lehtonen find that a broad mix of control mechanisms is found in any programme, though significant differences exist between programmes. Furthermore the level of self-control seems to be positively related to other control mechanisms. Lastely the authors show that the physical environment strongly impacts the control mechanisms. In their managerial implications Nieminen & Lehtonen conclude, that although ease of implementation is lowest for bureaucratic control – environments with ambigous goals need mechanisms of clan- and self-control. This entry was posted on Freitag, Oktober 3rd, 2008 at 13:56 and is filed under Control, IT Project, Multi-project management, Program Management. You can follow any responses to this entry through the RSS 2.0 feed. You can leave a response, or trackback from your own site.